No more cold fingers at the office! Customer satisfaction - read all about it! No more cold hands sitting at your desk. Do your hands and fingers get cold when you sit in front of your computer? It is a common problem in draughty office landscapes and badly tempered office rooms. With a heated deskpad placed under the keyboard at your desk, you get a comfortable warmth that reaches out to your fingertips and reduces the risk of rigid finger joints. Just plug in the cable into the socket and you are good to go! With the control on the top of the right hand corner you can adjust the temperature up to 55 degrees celsius. Four hours after the last temperature adjustment, the deskpad switches off automatically. It's simple to use, needs no additional space and gives you comfortable warmth after a few minutes. 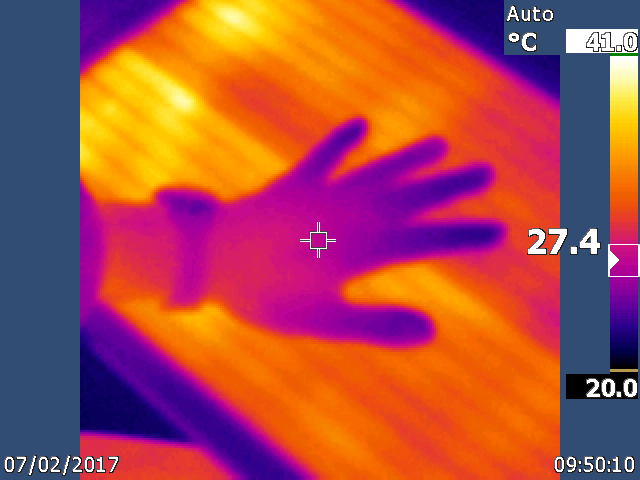 When hands and arms lie against the warm surface, only a small electric power is needed to create comfortable heat. The annual cost for the electricity is about 5 Euro. To avoid the discomfort of freezing is worth a lot more. "We have now tried the heated deskpads and we have now much more happy and warmer staff"
"I just have to say that the deskpad is simply fantastic!!!" No more cold controller at Property company in Göteborg. "The heated deskpad gives me the possibility to work a whole day"
Office worker with arthitis at Tetra Pak. Your salary cost is about 50 000 - 100 000 euros a year.